Buy your HOPPECKE 5 OPzV solar.power 420 - 2 V battery at the best price- online only. OPzV batteries are to be preferred when a high number of cycles, higher than 3.000 cycles, is needed. Their duration can exceed 20 years. They are limited to a discharge depth of more than 50%. These solar batteries offer excellent performance for your photovoltaic installations. Please respect the operating conditions: 25 ° C. Add distilled water every 2 to 3 years. The batteries are filled with sulfuric acid. OPzV battery: HOPPECKE 5 OPzV solar.power 420 batteries use OPzV lead technology. They are waterproof and particularly suited for installations in badly isolated rooms (extreme temperatures, freezing temperatures) or pooly ventilated rooms. 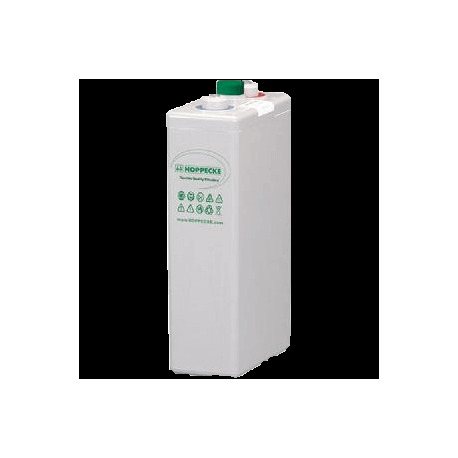 They are also suited for remote places as they do not require a water refill, unlike classic lead acid batteries. Working at 2 V: The HOPPECKE 5 OPzV solar.power 420 are sold from 6 units at 2 V, which allows for a voltage of 12 V. Add several batteries to your basket to get the desired voltage for your inverter. Storage capacity: 391 Wh: HOPPECKE 5 OPzV solar.power 420 batteries offer a capacity of 391 Wh to meet your needs. This equates to 391 W for a duration of 1 hour. If is not enough, add these same batteries multiple times to your basket. The capacity simply adds up.